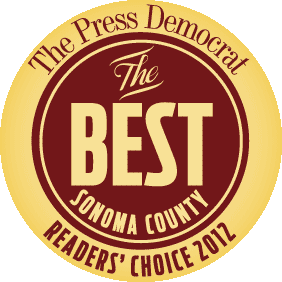 corehelp was voted winner of the Press Democrat Readers Choice Awards for the BEST COMPUTER TECH MAC REPAIR in Sonoma County! CoreHelp ROCKS!! I just recovered the last 2 years of my life (and my kids lives) in photos that I thought were gone! I had spent 2 days at the mall at the Apple Store trying to recover my iphoto library thanks to some bogus advice I had gotten from a previous "genius", my external photo hard drive wasn't backing up properly as I thought it had been to my time machine hard drive. Phil was able to show me within the first 5 minutes of walking in to the store that my pictures were recoverable. He also set up my time machine to back up my external photo hard drive which they were not able to do at the Apple Store. Not only is he totally knowledgable, but he is affordable and kind as well! If I ever have another issue with my mac, I will skip the geniuses at the Apple store and go directly to Phil, the real genius at Core Help! I wish I would have known about him before I cried a river over my lost photos! It could've saved me heartache and 2 awful days at the mall! Phil at Core help was a huge help when my hard drive broke. It was a stressful situation being as the computer held so much irreplaceable data and I had not been regular about backing it up. It was looking like a lot of files would be lost forever. But with Phil's help, the data was safely retrieved. I am glad to know that CoreHelp is there, if ever we have computer hard drive problems again. I was originally referred to Phil by the Apple Store in Santa Rosa for help with retrieving data. He discovered that contrary to their earlier evaluation, the hard drive was bad and needed replacing. Phil was professional, helpful, pleasant, and efficient. The charge for his service was extremely reasonable. 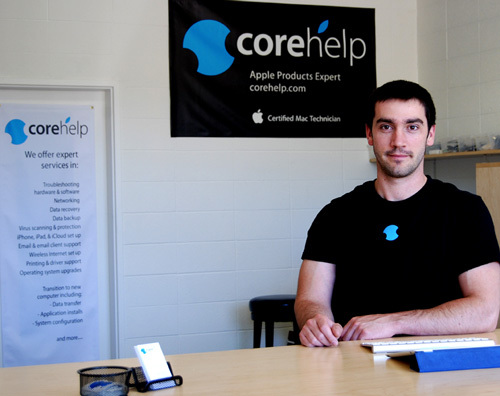 I strongly recommend Core Help should you need help with your Apple products. For myself, I would not hesitate to return should the need arise to service my iphone, IMac, or my macbook pro. Friendly, Painless Tech Support... a breath of fresh air when needing a break from the hectic energy at the Apple Store. Also, he came is under the Apple Store estimate and didn't have to send my macbook away. Do yourself a huge favor and go see Phil! We are so lucky to have Core Help in our community! Core Help did not require money up front, correctly diagnosed the problem even before opening up my laptop, and was $250 cheaper than the Apple Store. If you are ever in the unfortunate position of needing an Apple repair, you will quickly learn how awesome Core Help is, especially compared to what you are offered from Apple's repair policy. The very best!!! I've returned several times for help. Very impressed by the expertise as well as Pillip's patience and humbleness. Will send friends and family. I have already recommended Phil to everyone I know with a Mac. After a little coffee splash mishap (learned my lesson on that one! ), he got my MacBook up and running with a quick turnaround and for less $$ than I would have paid at the Apple Store. He's polite, friendly, straightforward, and very capable. It's nice to have the personal attention you get in a shop like his, and I'm happy to support a young local entrepreneur. Thanks Phil! Highly recommend! I had some work done on my laptop with Phil Fornaciari at Corehelp, and don't believe I could share my satisfaction any more effectively, other than to invite you to simply scroll down and read the reviews that have come before mine. A couple days later I went to the Apple Store to spy out a quote in order to see what the difference might have been had I let them work on my computer instead. I can tell you that the Apple Store would have easily been fifty bucks more. Why? Because Phil performed two simple, additional services for which I was not charged. Now, I do not wish to infer that Phil is in the business of giving away his services, but whereas the Apple Store doesn't think twice about checking a box and arbitrarily adding twenty-five bucks here and twenty-five bucks there, or selling you something you don't really need, it is evident that Phil is more in tune with building his business by going the extra mile in customer service... an all-American value with which fewer and fewer young people seem to be imbued these days. Although I am quite busy with my business right now I needed to travel to Santa Rosa recently to attend my 40 year high school reunion and took my Mac Book computer with me to monitor some ongoing business activity. When I encountered problems with my computer I contacted Corehelp with an emergency kind of request for assistance. Was very pleased with the immediate attention I received from Phillip Fornaciari. I'm living up near Redding, California and we just don't have a place here that services Apple computer products like you have there in Santa Rosa. I strongly recommend that anyone who might need help in, or around Santa Rosa; that you should definately take advantage of this business in that area. In fact, should I have problems in the future with my Mac I will probably just ship it directly to Corehelp rather than inquiring around here for any help. I rate this business a "10". Oh yes, I also have an HP. But I prefer using my Mac instead. The quality is just undeniable! Finally a superb resource close at hand for all of our Apple related issues that come up. Phil is terrific - he came out to our home on time, took care our multiple issues in short order, and came back promptly when our next set of issues came up. He is easy to talk to, extremely clear in his explanations, and very pleasant to work with. I'm planning on coming into his shop in the near future for assistance with our next piece of equipment. In short, the service is great and the price is right on the money. I was referred to CoreHelp by the Apple Store. My HD had crashed and the store replaced the drive, recovered my files using Time Machine. CoreHelp assisted me with the installation of Parallels and the upgrading of RAM from 4Gb to 8Gb. There was a run of diagnostics and some clean up and I was on my way. I found the service prompt, professional and caring. I highly recommend CoreHelp's services. Phil Fornaciari from Corehelp did an amazing job for us. Within a few minutes he was able to find our problem and fix it--this after our having spent hours--first with AT&T who said it was Apple's problem and then more hours with Apple telling us the problem was with AT&T. Ah, frustration! Phil listened, then ran thru the possibilities. He also reassured us that we did not cause the problem. Within a very short time the problem was fixed--he then helped us with some questions we had about our new operating system. We have already told our friends about the great service and know that when they have problems with their Macs they will find solutions at Corehelp. Thanks Phil. "Corehelp provided assistance with a hardware upgrade to my 2007 MacBook Pro in anticipation of attempting to install OS 10.8 Mountain Lion. The computer is heavily relied upon for both business and personal use and it is one of the oldest ones capable of a Mountain Lion OS upgrade. I was nervous. Phil Fornaciari provided this very nervous customer with expert advice and excellent service with the needed RAM installation and appropriate levels of encouragement for the upgrade project. His services were done by appointment, the needed parts were in stock, and the whole project took 20 minutes. The MBP is working perfectly and fulfilling the promise of OS 10.8. I recommend Corehelp's services very highly. I panicked when I lost my international characters feature. Had visions of a worm crawling its way through my computer. Phil tuned my Mac and got the feature running again. What a relief! I appreciated Phil's pleasant attitude, kind reassurance, and quick turnaround. My Mac Laptop wouldn't start. It was diagnosed as having a bad hard drive, I was told that my data could be compromised and I thought all my photos and important information would be gone! I went to Corehelp Mac Repair in Santa Rosa.... As soon as I walked through the door I knew my computer was in good hands. Phil the "Genius" I got help from a few years ago at the Apple Store was there. I am happy to say that Phil recovered ALL my data and replaced the hard drive. He also helped me set up a backup drive so that If a problem happened again, my data would be safe. Great work! Moseph - of West County! The Best Mac Repair AND located right in Santa Rosa! My Mac Computer was running slow... I could hardly get any work done. So I called Phil at corehelp, a true Apple Genius. He came to my office (for a very reasonable fee) diagnosed a bad backup hard drive. It was still under factory warranty, but I didn't have the receipt from where I purchased it. He went online was able to submit the info of defective device, got a RA number. Sent it back to the factory and a new drive was shipped out to me. He installed it and my computer is running up to speed. I love the fact that Phil will come to my office and help. I rely on my computer for work EVERYDAY, so taking my computer to the shop and downtime is out of the question. Thank you Phil! I brought my computer in because the DVD drive wasn't working. Phil was able to resolve the issue in a timely manner with professional accuracy. Easily the best Mac Repair hassle free and easy to find in Santa Rosa. You have made a customer for life! We are a total Mac family and have been for twenty-two years. We have used Phil at corehelp for both service and training and found him to be knowledgable, helpful and professional. He is patient at tutoring clients on the lower end of the technology learning curve but he also has the high level technical knowledge that today's competitive business climate demands. We can heartily endorse him and the service he offers both individuals and small business owners.